Patrick Ness isn’t the first novelist to remake their own work for cinema, and he won’t be the last. 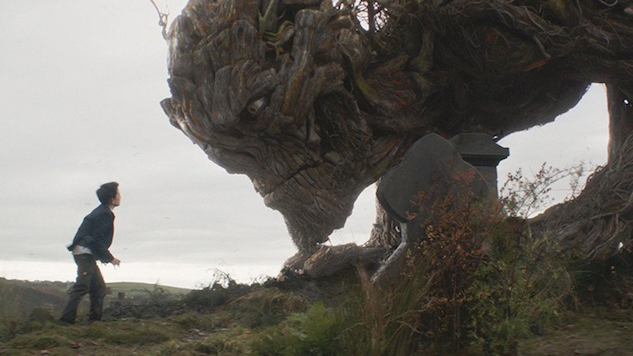 He is, however, aware that turning A Monster Calls, the 2011 novel he spun from ideas and characters conceived by the late Siobhan Dowd, into a movie is an inherently risky move. Anybody could screw it up in the process of shifting mediums, even him, and finding the right person to direct the result takes trust and faith. Enter The Orphanage’s J.A. Bayona, and presto, you have the right pairing for adapting A Monster Calls for the screen, though Ness wouldn’t call it an adaptation: He’d call it a remix. Readers and newcomers alike get to experience the story afresh through Bayona’s lens as a filmmaker, which blends its fantasy and horror qualities with his brand of emotional magic. Regardless of your familiarity with the source material, the film’s intentional blurring of genre boundaries is impressive. Back in October, Ness made a stop in Boston, where Paste Magazine met with him to discuss the experience of helping usher A Monster Calls into theaters. We chatted about guarding one’s writing, the trouble with genre snobbery in both the film and literary worlds, and the importance of curiosity among both writers and readers. Paste Magazine: About this time last year, I talked to Emma Donoghue about Room, and I asked her a question, which I’m going to ask you as well. I’m sure you’ve been asked it before, but what made you want to be the screenwriter for the adaptation of the book you wrote? Patrick Ness: It was specific to this one that I felt like I knew, if it works, I felt like I know why it works, or I felt like I know what’s important to me in this story. People have responded well to it, and I kind of think I know why they do, I hope. That sounds really terrible, but it’s more that I feel really protective of the material, because it came from Siobhan Dowd first, and so I’m a custodian of the material as well as its author. Hollywood always comes knocking when you have a book out, and it does okay, and certainly not everyone, but a few people, were suggesting changes, and I don’t mind the idea of changes, per se, but they weren’t changes that I agreed with. I didn’t think it should be softened. The mother should survive, for example, which was suggested, because I thought that was false. That’s kind of missing the point. So I thought, "I would rather it not be made than it be made badly, and I know I’m not a filmmaker, but why don’t I at least start the conversation and say, ‘Here are the things that are important to me in the story,’ and see if anybody responds?" They may not, that was the risk, that was always the risk. But I felt so close to the material that I didn’t want it to be messed up. [Laughing] That sounds terrible! Because I could have totally messed it up, so make sure you include that part. That’s always the risk you take. I could totally have messed it up. Again, definitely not a filmmaker, but at least I can say from the start, "This beat is important, this arc is important." Not as crass as that, but more, "This feeling is what I’m after, and do you, as a filmmaker, understand it, is it making sense, can we do something with it?" And [J.A.] Bayona came on and said, "Yeah," and it was really, really fruitful. Ness: What did Emma Donoghue say? Paste: I remember her saying she just wanted to approach her story in a new way, I think that was interesting to her. Ness: I never use "adaptation," because that felt quite fusty to me, so the word I told myself is "remix." I understand what a remix does. The original song remains, and that’s the important thing: The book remains. But you’re taking it from one kind of song to another kind of song, and I understand that process. It’s still the same song, you can still recognize it as the same song, but it has to do different things, and that was interesting to me. I really wanted to learn this stuff, because complacency is the biggest enemy to any writer, I think. I didn’t want to just settle down, I wanted to be frightened and learn something new. Paste: I’m also intrigued by you talking about being the custodian. I write in a different capacity than you do, but I feel protective, in a way, where I feel like I’d be hurting something that I’d created if I had to go adapt it to another medium. That wasn’t ever a concern for you? You didn’t feel like you were picking and choosing your favorite children to show up in the screenplay? Ness: No, not really. I mean, if I was afraid of that, I would have thought that I’d made a bad movie, because you can absolutely be overly protective. But it was definitely the philosophy that the book remains, and I will work as hard as I can to make the movie as good as I can, but the book will always stay. And that felt a little bit freeing. And also, honestly, what it really seems to come down to is trusting the people you choose to work with. You’re never gonna always get it right, everything’s a risk, but I’d held onto the rights, and I’d held onto the screenplay, hadn’t sold anything, and then I was lucky to find a filmmaker who seemed to understand my point of view on it, and he brought all this great new stuff to it from his point of view. That’s the only thing you can take. It’s always a risk, but that’s the only way to minimize the risk: to just find somebody you trust, and hope for the best. Paste: What is life without risk, after all? Ness: Exactly. Well, that’s the point of this, really. Every book’s a risk, you know? Paste: That’s true. So you were happy with the marriage between the material and Juan Antonio? Ness: Yeah! Both The Orphanage and The Impossible take the child’s point of view with a kind of seriousness that I respect, and what I try to do in my work. It’s not overly indulgent, because kids don’t want that either, but it’s just calmly saying, "Yes, what you’re going through is important, and it is serious. It’s not something we should dismiss." And that is a small act, but it’s revolutionary, really, and it’s kind of the core of my storytelling, and most "why" storytelling, you know, "why" storytelling that I like. The other thing that he does, which is something I always do, is a lack of snobbery about genre boundaries. I don’t think there is such a thing as a realistic story. Even if it looks realistic, it’s still contrived, conceived, a character’s arc, coincidences and so on, everything [in the] story is driven, and so if you acknowledge that, then the bleeding of a boundary is much easier. And he just implicitly does that in his films. The Orphanage could be called a horror film, but it’s got emotional impact. The Impossible is a disaster film with an emotional impact. If you’re not a snob, your palate is so much richer. It’s so much wider.